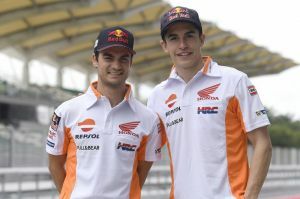 Seventy-four days after the Repsol Honda Team ended their successful 2016 campaign in Valencia, reigning MotoGP World Champion Marc Marquez and teammate Dani Pedrosa are ready to return to action for the first of three days of testing, starting 30 January at Malaysia’s Sepang International Circuit. The Malaysian stint will be the first of the three official MotoGP Tests that will also bring the Repsol Honda men to Australia (Phillip Island – 15-17 February) and Qatar (Losail – 10-12 March) before the 2017 MotoGP World Championship gets underway in Qatar on 26 March. Following important rule changes introduced in the series last year, the 2017 season won’t see major updates to technical regulations, with the exception of those regarding aerodynamics—the most conspicuous being the banning of winglets—and the dropping of Michelin’s intermediate tyres. A noteworthy adjustment to pit-lane rules regards bike swaps in case of flag-to-flag races; a maximum of four team staff will be allowed to assist a rider, and they will be required to wear helmets, a policy that the Repsol Honda Team already voluntarily adopted last year on the occasion of the Australian GP.